Running low on dish soap? Consider replacing your store-bought brand with this natural cleaner. Today’s experiment: Homemade Dishwashing Liquid. I took this recipe from passionatehomemaking.com, which is a treasure trove for frugal, natural product recipes. If you are trying to get away from the chemicals, and into the green scene, I suggest you head on over to that site and nose around. I’m going to be up front about this recipe. I’m not really sure that it is cheaper than your cheapest store brand dishwashing liquid. Because I know those suckers are cheap. However, this is cheaper than the greener, natural, pre-made soaps you are going to find at your local mass-merchandisers or your health food stores. So, that being said, if you are happy with your store brand dish soap, you may just want to pass over this one. If you buy soap from health food stores or you are looking for a healthier option, this one’s for you. 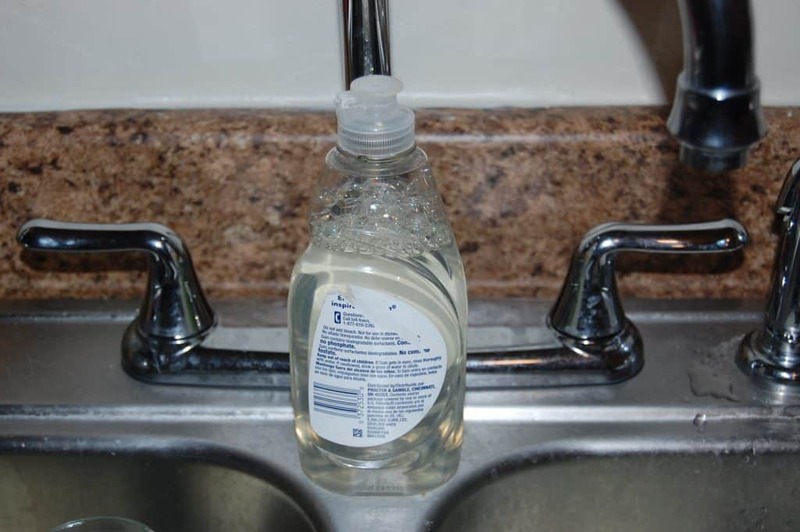 Simply pour these ingredients into an old dish soap bottle, close the lid, and shake it up. Voila! You’ve got homemade dish soap! This recipe is so easy. The hardest part is making sure you have all the ingredients. But once you do, those ingredients will last you a while. I’m still on my first bottle of tea tree oil, which I bought a year ago. And one bottle of Sal Suds last me about four months. I already had the other ingredients laying around my house. I’ve very pleased with this recipe. I’ve looked online for other recipes and they often contain borax or washing powder. I don’t have any experience with these other options and don’t know how safe the powders are. Sometimes, I choose cheap over healthy (as in, I don’t buy organic vegetables), but in the case of my homemade products, I’m trying to be as healthy as possible. I did try to use this solution in the dishwasher. I would not recommend it. It did not remove food and grease like I had hoped it would. And all the dishes were left with watermarks. Now we moved and our new apartment does not have a dishwasher. Well, it does. I’m the new dishwasher. And this recipe is working great with my elbow grease. I know that the lemon juice and vinegar in the recipe are used for breaking down oils. This recipe does not work as well doing that as a commercial product does. So I just make sure to put my oily and greasy dishes in the water last because I found that everything that goes in there after the bowl that had butter in it feels a little oily even after being washed. All in all, I’m pleased, and I’m going to keep using this recipe. Do you make your own dishwashing solution? Let us know how it’s working for you. Are you going to give this a shot? Let me know how it turns out.